Discoloration of the skin can be really distressing. It doesn’t however have to be something to worry about. Most discoloration in skin is natural, and a purely cosmetic problem. That’s not to say it’s any less important though – plus there is a lot you can do about it. When we refer to discolored skin, this means any area of your body that has either darker or lighter patches. It may be just a spot or freckle, or it could be an entire area of your body such as a darkening or skin discoloration on the face or neck. The most important thing is to first make sure you know what you are dealing with. Freckles or moles are of course perfectly harmless, as are most skin blemishes and darker or lighter patches of skin. But if you are in any doubt please make sure you get a doctor to look at the area of concern before you do anything else. Serious conditions such as skin cancer require medical attention. We only discuss cosmetic skin problems on this site. This site does NOT attempt to diagnose or provide ANY medical information or advice. Please seek advice from a medical professional. Skin tone and color can change naturally over time. There are however factors such as sun damage that can greatly accelerate those changes. UV from the sun will naturally make your skin darken. The action of UV from sunlight reaching our skin triggers the production of melanin, which is our natural skin pigment or coloration. It’s a natural defence mechanism to darken the skin to increase protection. There is a vast difference of course between getting a little sun on our skins, and seriously damaging our skin by regularly laying on a beach for hours a day. Our bodies actually produce Vitamin D when they get sunshine directly on our skin. So it’s important to eat foods such as oily fish, red meat and eggs (or take a supplement) if you plan to block all sunlight from reaching your skin. Aging leads to thinner paler skin, but also typically sees an increase in age spots (or liver spots). Particularly in those areas that have been more sun-exposed such as face, neck, hands and arms. 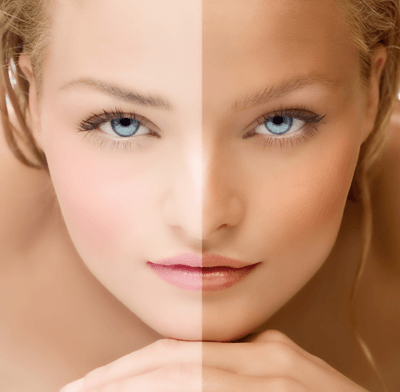 So sun exposure is certainly one of the major contributors to skin discoloration, but far from the only one. Many forms of discoloration are something we were born with or are related to hormonal changes in our bodies. This can be darker or lighter areas too. What causes discoloration of the skin may even be little understood. There are lots of different types of hyperpigmentation or darkening of the skin. Typically this means areas of brown discoloration of the skin. ‘Hyper’ means lots of something – in this case melanin or pigment/coloring of the skin, which creates dark spots or patches on the skin. ‘Hypo’ on the other hand means small, in this case referring to a lack of melanin/pigmentation leading to light or whiter skin patches. Melasma is one of the most commonly experienced. It appears as a darkening of skin on the face. Whilst commonly experienced by pregnant women (it’s also known as the ‘mask of pregnancy’), it can actually affect anyone. Increased levels of estrogen make the condition worse – which is why pregnant women often experience it, as well as women taking birth control pills. It can affect men too though. Getting rid of it is not quite so easy, but limiting sun on your face helps along with the use of skin whitening creams. Other hyperpigmentation problems can range from birthmarks to white discoloration on the skin such as freckles and moles. At the opposite end of the spectrum we have hypopigmentation, which can be just as distressing. Here the skin lacks pigment creating lighter or even white discoloration on the skin. Most commonly experienced here is vitiligo. It’s a condition we still don’t fully understand, although doctors now believe it could indicate an immune system problem. The condition itself is not dangerous but it can be very distressing. It could affect small areas on the hands or face, or for some people much larger areas across the whole body. Steroidal treatment is often prescribed, although treatment with UV lights and creams to even out the pigmentation can also be effective. Other hypopigmentation problems can originate from scarring such as acne scars, surgical scars or simply cuts and abrasions. Or even fungal conditions such as tinea versicolor. Read more in What Is Hypopigmentation? If you’re trying to relieve darkened facial skin due to melasma, or want to even out darker or lighter areas then a skin discoloration cream is typically recommended. There is a vast range of these skin whitening creams available although they vary greatly in quality and results. Read our whitening cream reviews for more details of products available. Bear in mind that some products do contain harsh ingredients such as hydroquinone (which is even banned in some countries). Although there are also products available that just use more natural ingredients too. Other options include microdermabrasion or chemical peels, typically done at a professional salon. These processes remove the outer, dead layers of the skin with the aim of revitalising and regenerating your skins appearance. It can help lighten darker dull looking skin, and possibly even help with brown sun spots too. The downside is of course that professional treatments are not cheap. Although you can also now get home microdermabrasion machines too. The term itself is not rigidly defined however as some people use the same term to mean any kind of skin lightening process. This is worth being aware of when researching products or treatments available. To fix discolored skin is generally going to take time though. You should allow for weeks to start seeing improvements, and months to reach the full potential of any skin product or treatment you have chosen. You may even have to try more than one approach, just don’t give up hope as there are solutions. It may also help to set yourself realistic expectations – aim for an improvement in appearance of a discolored area. If it becomes less noticeable to you that’s a great result. If it disappears entirely then consider that a real bonus.